There’s something about bundt cakes that just makes me smile. I don’t know whether it’s the hole in the middle, the way the sides are fluted which creates a really neat design, or just the word “bundt” itself. Whatever it is, I’ve had a mild love affair with the bundt cake ever since discovering mi mama’s pan crammed way back in the depths of her kitchen cupboards. Apparently she had hidden it away after some sort of disaster Jell-O incident involving lack of gelatinization and a red sticky mess being poured all down her pants. Note to all: you must allow the Jell-O to sit in the fridge at least an hour to congeal before attempting to turn out onto a serving plate. Oh well, we can’t all be geniuses… obviously, that train left her station long ago. Over the years, I definitely believe I’ve gotten to the point of mastering my abilities in the area of the bundt cake. I can do no wrong. I mix, I pour, I bake and whammo, magic pops out of the oven and onto a plate. Few would attempt to challenge this claim. Those who have, may or may not have gotten a little brown “present” left in their favorite pair of shoes. This past Sunday, mi mama, papa and I were invited to attend a lovely brunch out by the lake, and of course, I was requested to bring along one of my delicious creations. Ding ding ding! 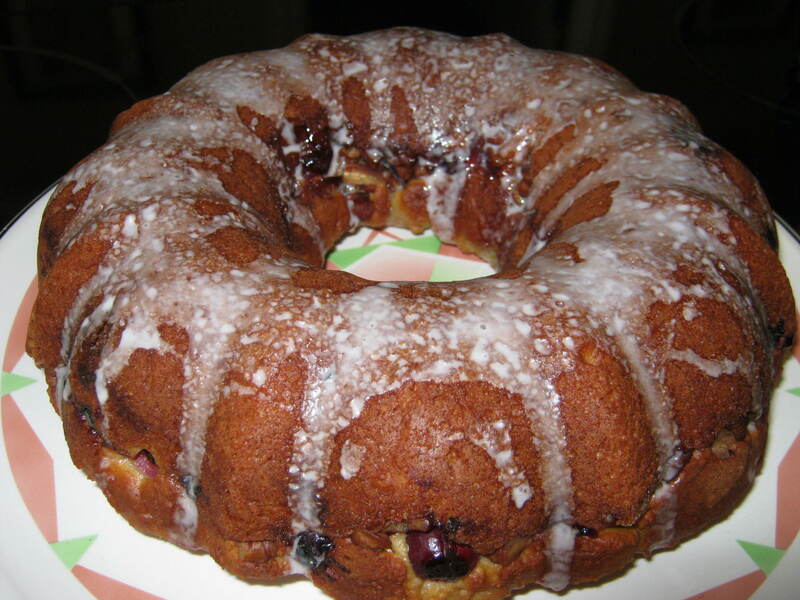 Why not a bundt cake? And after noticing mi mama’s recent Costco purchase of 10 lbs of fresh cranberries (bladder issues, maybe?) I immediately got to work concocting a yummy bundt-panned coffee cake. 1) Pre-heat oven to 350 degrees. Grease a bundt pan with cooking spray. 2) In a medium bowl, whisk together the flours, baking soda and salt. 3) In a small bowl, stir together the granulated sugar, cinnamon and pecans. 4) In a large bowl, beat together the brown sugar, butter and applesauce until fluffy. Beat in the eggs, 1 at a time, until fully combines. Beat in the vanilla and yogurt. 5) Add the flour mixture, stirring until just combined. Do not overmix. 6) Spread half of the batter into the bundt pan. Top with the cranberries, gently pressing them into the batter. Sprinkle with the nut mixture. Spoon the rest of the batter over the berries and nuts, smoothing the top. 7) Bake 35-40 minutes or until a toothpick inserted comes out clean. Let cool slightly before turning out onto a cooling rack. 1) Mix sugar with milk using an electric hand mixer until smooth. 2) Drizzle over completely cooled cake. 3) Serve along with your favorite cup of tea and enjoy! Well, amigos, I must be going now. It’s my day to do the grocery shopping. 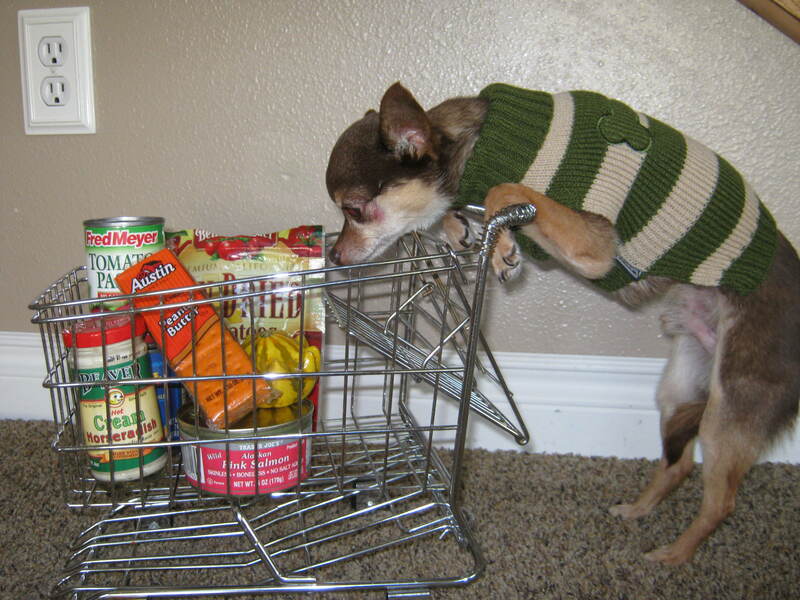 Hey, who put those crackers in my cart! HOLY HOT DOG!!!! Your pup is hilarious!! Well, Juan, your cake was a hit. Can’t imagine what your momma and papa would do without you to do all the cooking. Hope they reward you bountifully!